The Royal Palace at Bang Pa-in is just north of Bangkok and definitely worth a visit. Enjoy the beautiful grounds and variance in architecture. 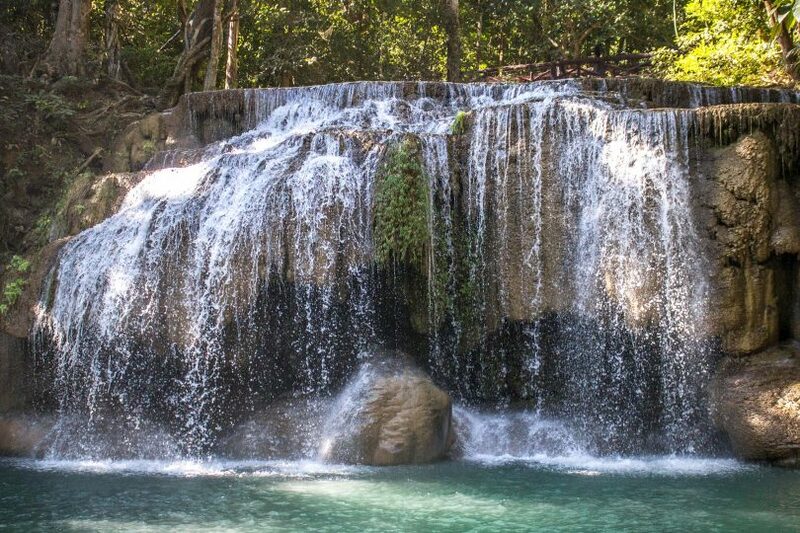 The Erawan Falls are on the most popular spots in all the national parks of Thailand. Just a short trip from Kanchanaburi, it’s a beautiful place to relax. Bangkok is famous for its delicious street food but it can sometimes be hard to know where to start. So I’ve gone to an expert to find out everything! It was once the largest city on earth, a trading metropolis with people from around the world. Now there are just ruins… still worth the visit, though! If you visit one temple in Bangkok, make it this one! One of the best places to see the cultural side of Bangkok is Wat Pho. The temple complex is huge with lots to explore, including the reclining Buddha. Bangkok’s flower markets are a 24 hour affair, where professionals and visitors can pick up some of the freshest produce in the country. Full of colour! There’s a cycle of drugs, violence and poverty inside Bangkok’s biggest slum. But some of the residents are trying to get out – and they’re thinking big! The Thai capital is a city that needs to be experienced to be believed. Bangkok offers anything you could possibly want… but how does that leave you?